Why is the Atonement necessary for our salvation? For teachers: Simple charts and pictures can help class members or family members understand principles and doctrines. Consider making a chart with two columns, one labeled Results of the Fall and the other labeled Blessings of the Atonement. Use information from this chapter to fill in the chart. Jesus Christ “came into the world … to be crucified for the world, and to bear the sins of the world, and to sanctify the world, and to cleanse it from all unrighteousness; that through him all might be saved” (D&C 76:41–42). The great sacrifice He made to pay for our sins and overcome death is called the Atonement. It is the most important event that has ever occurred in the history of mankind: “For it is expedient that an atonement should be made; for according to the great plan of the Eternal God there must be an atonement made, or else all mankind must unavoidably perish; … yea, all are fallen and are lost, and must perish except it be through the atonement” (Alma 34:9). The Fall of Adam brought two kinds of death into the world: physical death and spiritual death. Physical death is separation of the body and spirit. Spiritual death is separation from God. If these two kinds of death had not been overcome by Jesus Christ’s Atonement, two consequences would have resulted: our bodies and our spirits would have been separated forever, and we could not have lived again with our Heavenly Father (see 2 Nephi 9:7–9). But our wise Heavenly Father prepared a wonderful, merciful plan to save us from physical and spiritual death. He planned for a Savior to come to earth to ransom (redeem) us from our sins and from death. Because of our sins and the weakness of our mortal bodies, we could not ransom ourselves (see Alma 34:10–12). The one who would be our Savior would need to be sinless and to have power over death. Why was Jesus Christ the only one who could atone for our sins? There are several reasons why Jesus Christ was the only person who could be our Savior. One reason is that Heavenly Father chose Him to be the Savior. He was the Only Begotten Son of God and thus had power over death. Jesus explained: “I lay down my life, that I might take it again. No man taketh it from me, but I lay it down of myself. I have power to lay it down, and I have power to take it again” (John 10:17–18). Jesus also qualified to be our Savior because He is the only person who has ever lived on the earth who did not sin. This made Him a worthy sacrifice to pay for the sins of others. As you read this section, imagine yourself in the Garden of Gethsemane or at the cross as a witness of the suffering of Jesus Christ. The Savior atoned for our sins by suffering in Gethsemane and by giving His life on the cross. It is impossible for us to fully understand how He suffered for all of our sins. In the Garden of Gethsemane, the weight of our sins caused Him to feel such agony that He bled from every pore (see D&C 19:18–19). Later, as He hung upon the cross, Jesus suffered painful death by one of the most cruel methods known to man. On the third day after His Crucifixion, Christ took up His body again and became the first person to be resurrected. When His friends went to seek Him, the angels who guarded His tomb told them, “He is not here: for he is risen, as he said” (Matthew 28:6). His spirit had reentered His body, never to be separated again. Christ thus overcame physical death. Because of His Atonement, everyone born on this earth will be resurrected (see 1 Corinthians 15:21–22). Just as Jesus was resurrected, our spirits will be reunited with our bodies, “that they can die no more … , never to be divided” (Alma 11:45). This condition is called immortality. All people who have ever lived will be resurrected, “both old and young, both bond and free, both male and female, both the wicked and the righteous” (Alma 11:44). For teachers: Object lessons can help class members and family members understand principles and doctrines. To explain death and resurrection, consider this object lesson: Put your hand in a glove. Explain that a hand in a glove can be compared to a person’s spirit in his or her body. Take off the glove. Explain that this is like physical death—the spirit (the hand) and the body (the glove) are separated. Then put the glove back on your hand. Explain that this is like resurrection—the spirit and body are reunited. How has your knowledge of the Resurrection helped you? Think about how the parable in this section helps us understand the Atonement. Whom do the people in the parable represent in our lives? 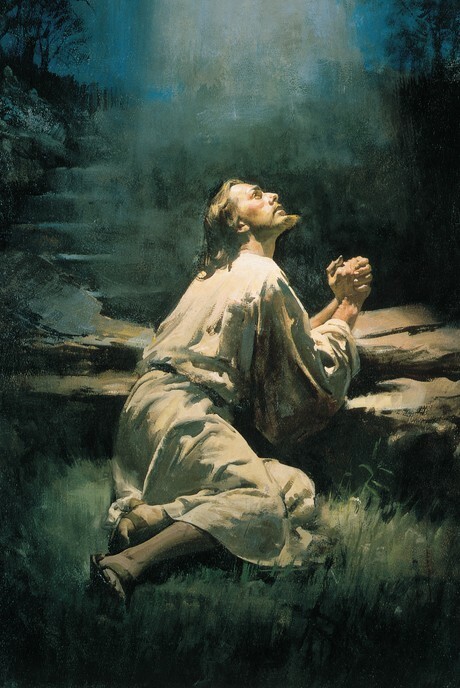 The Savior’s Atonement makes it possible for us to overcome spiritual death. Although all people will be resurrected, only those who accept the Atonement will be saved from spiritual death (see Articles of Faith 1:3). We accept Christ’s Atonement by placing our faith in Him. Through this faith, we repent of our sins, are baptized, receive the Holy Ghost, and obey His commandments. We become faithful disciples of Jesus Christ. We are forgiven and cleansed from sin and prepared to return and live forever with our Heavenly Father. The Savior tells us, “For behold, I, God, have suffered these things for all, that they might not suffer … even as I” (D&C 19:16–17). Christ did His part to atone for our sins. To make His Atonement fully effective in our lives, we must strive to obey Him and repent of our sins. President Boyd K. Packer of the Council of the Twelve gave the following illustration to show how Christ’s Atonement makes it possible to be saved from sin if we do our part. “He had been warned about going into that much debt, and particularly about his creditor. But it seemed so important for him to do what he wanted to do and to have what he wanted right now. He was sure he could pay for it later. “‘I cannot pay you, for I have not the power to do so,’ he confessed. “‘If you do not forgive the debt there will be no mercy,’ the debtor pleaded. “‘If I do, there will be no justice,’ was the reply. “The debtor, in turn, had been extended mercy. Both laws stood fulfilled. Because there was a mediator, justice had claimed its full share, and mercy was fully satisfied” (in Conference Report, Apr. 1977, 79–80; or Ensign, May 1977, 54–55). “Behold, I have come unto the world … to save the world from sin. “Therefore, whoso repenteth and cometh unto me as a little child, him will I receive, for of such is the kingdom of God. Behold, for such I have laid down my life, and have taken it up again; therefore repent, and come unto me ye ends of the earth, and be saved” (3 Nephi 9:21–22). Ponder how you can show gratitude for the gift of the Atonement. “Make every effort to listen sincerely to learners’ comments. Your example will encourage them to listen carefully to one another” (Teaching, No Greater Call , 64).